. 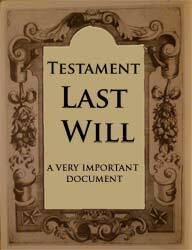 To properly draft a last will (testament) legally valid in Thailand is highly recommended to seek the assistance of an expert lawyer. The remaining half of the patrimony if you are married, or the totality of it if you are single or divorced, can be bequeathed to anybody without restrictions. In other words, you can "disinherit" your children or anybody else and freely decide to whom to bequeath your properties without any limits. Although it is true that Thai law gives us these wide powers of discretion which would be unthinkable in the majority of Western countries, when it comes to actually taking possession of an inheritance, things are not as easy as they might appear. If we truly care about our loved ones who will survive us, we had best be extremely prudent and provident "before" our passing and draw a proper Last Will (Testament) with the help of our Lawyer in Thailand.